Kristin Gaspar, a Republican supervisor in San Diego County, said criminals have the luxury of finding sanctuary either “across the border” in Mexico or in California, where she said they are “shielded by Gov. Moonbeam”—a derogatory nickname for California’s Democratic governor, Jerry Brown. Ms. Gaspar is a candidate for the House seat currently held by Darrell Issa (R., Calif.), who is retiring. At one point, as the discussion turned to gang members, Mr. Trump touted his record in expelling people from the country. “We have people coming into the country, or trying to come in—and we’re stopping a lot of them—but we’re taking people out of the country,” he said. Donald Trump continues to make inflammatory statements regarding Mexico. Sadly, Donald Trump does not seem to appreciate or understand the biblical prophecies related to the USA. Therefore, it is likely that he will continue to take steps that will upset various global leaders not realizing how this will turn out–like he recently did with Europe (see More are seeing Donald Trump causing problems between the USA and Europe: ‘with friends like that (the USA) who needs enemies’). Last month, Mexico did make a trade deal with the Europeans (see EU and Mexico making a trade deal, partially to send Donald Trump a message). Many in Mexico believe that the USA improperly took lands ranging from Texas to California and points in-between. They believe that they are entitled to receive that land back. It has been called the “reconquista” (“re-conquering” in English). Interestingly, the Bible teaches that the European King of the North power will takeover the USA and divide its land for gain (Daniel 11:39; see also Will the Anglo-Saxon Nations be Divided and Have People Taken as Slaves? 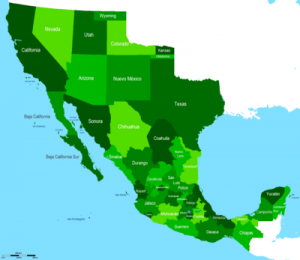 )–Mexico will likely end up with at least some of its claimed lands back this century. And yes, I believe that Mexican troops will one day align with Europe. I expect that Mexico will end up with at least some of its claimed lands back this century. The picture at the beginning of this post is from about a decade ago. 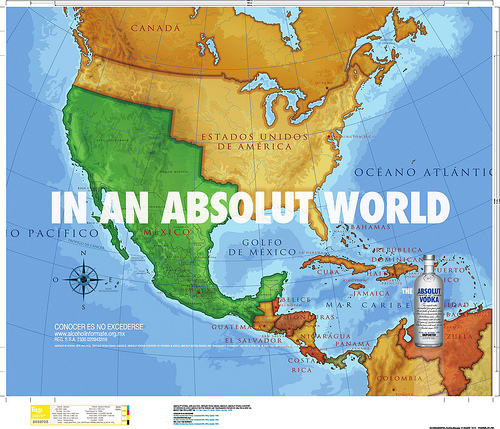 It was put out by Absolut, a brand of vodka. The hope was to appeal to Mexicans who believe that Mexico is entitled to get lands back that the USA ended up with in the 19th century. Mexico will get at least some of those lands back after the start of World War III. Decades ago, I concluded that Mexico would one-day help the Europeans against the USA. Statements by US President Trump and reactions from Mexican officials show that day is getting closer. The final Time of the Gentiles is coming and it will NOT end well for the USA (cf. Daniel 11:39). This entry was posted on Thursday, May 17th, 2018 at 6:00 am	and is filed under Prophecy.